An increase in newly detection of incidental small renal masses has reached to 2%-3.1% per year owing to routine application of multiple imaging modalities [1, 2]. Small renal tumors were more likely to originate in patients with elderly age and comorbidities . That's why sufficient renal function preservation and fewer complications were also important besides satisfactory oncological outcomes. Partial nephrectomy (PN) has been adopted as standard treatment for stage T1a renal tumors. Recently guideline has recommended PN rather than radical nephrectomy as management for selected T1b renal tumors . PN can be conducted under open conditions, with laparoscopy or robotic assistance [5, 6]. Ablative therapies have been regarded as an alternative method to PN [7, 8]. Most frequent ablative technologies are cryoablation and radiofrequency ablation . Cryoablation was considered as the most efficacious alternative to PN because of the lower possibility of local-recurrence and metastatic progression compared with radiofrequency ablation [9, 10]. Cryoablation can be performed with laparoscopy or percutaneous image guidance. Both approaches were reported to be safe and efficient to treat stage T1 renal tumors [11, 12]. More and more articles have reported that cryoablation could be applied for renal tumors up to T1b but not limited to small renal masses (usually defined as renal mass ≤ 4cm) [8, 13, 14]. A meta-analysis comparing laparoscopic cryoablation with laparoscopic PN for small renal masses has been reported . 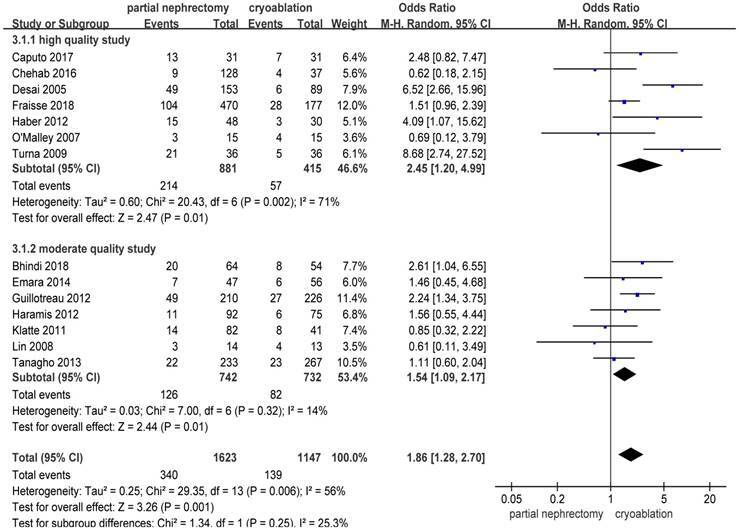 However, no study systematically reviewed cryoablation for T1 renal tumors compared with PN. Several studies have compared cryoablation and PN applied to T1 renal masses [2, 3, 8, 10, 13, 14, 16-26], which may provide evidence that cryoablation could be an alternative challenging PN for surgical high-risk patients with T1 renal masses. 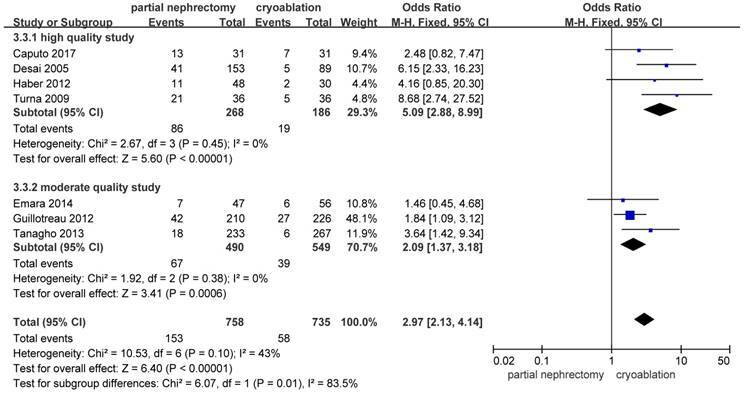 Along with those series, a systematic review and meta-analysis was carried out to investigate the efficacy and safety of cryoablation for T1 renal masses compared with PN. A comprehensive literature search utilizing the major electronic databases (PMC, EMBASE and the Cochrane Library) up to September 2018 was not restricted to regions or languages. (“partial nephrectomy” [Title/Abstract] or “nephron sparing surgery” [Title/Abstract]) and (“cryoablation” [Title/Abstract] or “cryotherapy” [Title/Abstract]) were combined as search terms. Related articles were also identified manually with screening the reference lists of all retrieved articles. The following inclusion criteria were necessary: (1) Article has been published or accepted for full-length publication; (2) Article must be designed as a prospective or retrospective study that compared cryoablation and PN for T1 renal tumors; (3) At least one of the outcomes of interest below is evaluated and data is extractable. The following exclusion criteria were used: (1) A review or meta-analysis; (2) No available data could be extracted. (3) Editorials, letters, case report or animal experimental studies. Following outcome variables were extracted to assess the efficiency and safety between cryoablation and PN. 1. Oncological variables: all-cause death, cancer-specific death, metastasis, local-recurrence. 2. Variables about renal function change: percent estimated glomerular filtration rate (eGFR) decrease, creatinine increase. 3. Variables about perioperative complications: overall complication rate, intraoperative complication rate, postoperative complication rate. Data from the included studies was extracted and calculated separately by two authors (Deng and Chen). Discussions were necessary until no doubt existed whenever there was a disagreement. Following information was obtained from every included article: first author's family name; year of publication; study design; number of included cases in both groups; cohort representative; surgical approach of each group; comparability between two groups; follow-up outcomes. Criteria enacted by the Center for Evidence-Based Medicine was used to rate included studies for the level of evidence . The modified Newcastle-Ottawa scale was used to assess the methodological quality of retrospective studies . The scale evaluates risk in three factors of study design: patient selection; comparability between two groups; assessment of outcomes. Every study was scored from 0 to 9. High quality study was defined as study getting a score of ≥7, otherwise studies were considered to be of moderate quality. Hazard ratio (HR), mean difference (MD) and the odds ratio (OR) were used to measure the oncological variables, the renal function change and the complication rates, respectively. All outcomes were presented with 95% confidence intervals (95%CI). The method summarized by Tierney et al. was used to calculate HRs and 95%CI when the data wasn't provided directly. When renal function change was presented as medians and ranges, the means provided by Hozo et al. was used to convert the data into means with standard deviations. Yates' correction was used when no complication occurred in one of two groups . Chi-squared test with significance set at p < 0.10 was used to assess the statistical heterogeneity between studies. The I2 statistic was used to quantify heterogeneity. The fixed-effects (FE) model was applied to pool data if no significant heterogeneity existed between studies, or the random-effects model was applied . In order to assess the stability of every outcome of interest, original analyses were repeated with exclusion of the study that got the lowest score to conduct sensitivity analyses. To explore the source of heterogeneity, subgroup analyses were performed according to the quality of included studies. A funnel plot about all-cause death was inspected visually to assess the potential for publication bias. Review Manager 5.3 (Cochrane Collaboration, Oxford, UK) was run to conduct all statistical analyses. A p value < 0.05 was deemed to mean statistically significant. Seventeen studies [2, 3, 8, 10, 13, 14, 16-26] fulfilling the inclusion criteria drafted in advance were singled out from the 1059 potentially relevant studies. Details of study selection were shown in flow-process diagram (Figure 1). All included studies were published in full with a retrospective observational study design. Level of evidence of all selected studies was 3b owing to their study design. More characteristics of the included studies were presented in Table 1. No appropriate protocol was employed in advance to allocate patients and assign treatment in the retrospective studies, but just according to physician's discretion. Information about allocation concealment or the blinding method was not mentioned in studies. Comparable information about the included patients between the two groups varied from article to article. The mean follow-up period of every group in all studies was up to 6 months. 8 eligible studies got a score ≥ 7 according to Newcastle-Ottawa Scale (Table S1) [8, 14, 16-18, 20, 24, 25], while the remaining ones were marked as moderate quality studies [2, 3, 10, 13, 19, 21-23, 26]. Most studies did not describe clearly about how to deal with missing data or intention-to-treat analyses. PN = partial nephrectomy; CA = cryoablation; m = months. R = retrospective; RP = retrospective design, prospective data collection; O = open; L = laparoscopic; R = robot-assisted; P = percutaneous. Matching variables: 1 = age, 2 = gender, 3 = body mass index, 4 = tumor size, 5 = preoperative renal function, 6 = tumor side, 7 = tumor location, 8 = nephrometry (RENAL) Score, 9 = American Society of Anesthesiologists score, 10 = Charlson comorbidity index. Forest plot and meta-analysis of all-cause death. Forest plot and meta-analysis of cancer-specific death. Available data provided by 8 of the 17 studies was pooled for all-cause death with nil heterogeneity [8, 10, 13, 14, 17, 20, 25, 26]. Original result indicated that stage T1 patients undergoing PN showed a significantly lower all-cause death compared with those undergoing cryoablation (HR, 0.52; 95%CI: 0.41 to 0.65; p < 0.001). Both the high quality study subgroup and the moderate quality study subgroup got as significant as the original result while the heterogeneity remained nil ((HR, 0.43; 95%CI: 0.31 to 0.61; p < 0.001) and (HR, 0.60; 95%CI: 0.44 to 0.82; p = 0.002), respectively) (Figure 2). HRs on cancer-specific death could be extracted or calculated from 6 included studies [10, 13, 14, 20, 25, 26]. Significant higher possibility to cancer-specific death was found in the cryoablation group compared with the PN group (HR, 0.43; 95%CI: 0.21 to 0.91; p = 0.03). In the high quality study subgroup, the pooled HR was 0.14 (95%CI: 0.03 to 0.67; p = 0.01) without between-study heterogeneity. But no significant difference was found between the two treatment groups in the moderate quality study subgroup with slightly increased heterogeneity (HR, 0.60; 95%CI: 0.26 to 1.39; p = 0.23; I2 = 6%) (Figure 3). 4 studies [8, 13, 19, 20] including 2255 patients provided available details about the risk of metastasis. Statistical significance in the incidences of metastasis was found between the PN group and the cryoablation group (HR, 0.41; 95%CI: 0.26 to 0.67; p = 0.0004). The FE model was used to pool the result owing to the low heterogeneity. Results of the two subgroups remained to be significantly different between the two treatment groups, while the heterogeneity between the moderate quality studies increased to a high level (Figure 4). Data on local-recurrence could be extracted from 11 studies [3, 8, 10, 13, 14, 17-20, 22, 26]. The FE model was used to pool the data on the basis of the insignificant heterogeneity. The rate of local-recurrence in the cryoablation group was significantly higher than that in the PN group (HR, 0.35; 95%CI: 0.25 to 0.50; p < 0.001). Significant results were also concluded in the two subgroups while the heterogeneity between studies was decreased in the high quality subgroup and the opposite change was detected in the moderate quality subgroup (Figure 5). Forest plot and meta-analysis of metastasis. Forest plot and meta-analysis of local-recurrence. Pooled data about percent eGFR decrease from 6 studies [10, 13, 14, 19, 20, 23] indicated a significantly better renal function preservation in the cryoablation group compared with the PN group (MD: -4.84; 95%CI: -7.02 to -2.36; p < 0.0001). The data was pooled without heterogeneity using the FE model. Results of the two subgroups were consistent with the original result (Figure 6). There was no heterogeneity in 3 included studies [2, 20, 25] focusing on creatinine increase. The pooled WD for creatinine increase was 0.15 (95%CI: 0.04 to 0.26; p = 0.006) indicating that cryoablation protected renal function significantly better than PN for T1 renal tumor cases. Subgroup analysis showed the same outcome as the original meta-analysis (Figure 7). 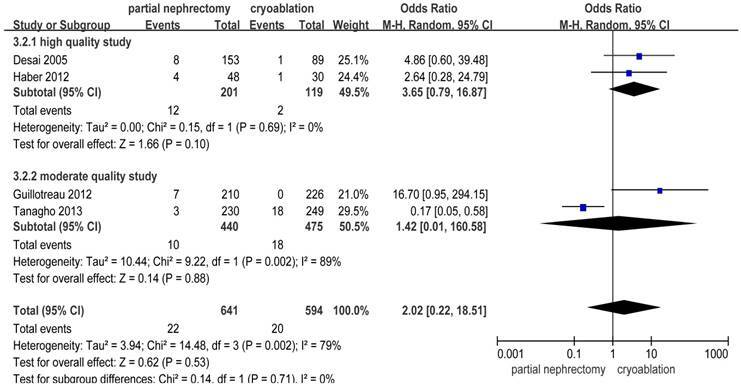 There were significantly more overall complications and postoperative complications in the PN group than the cryoablation group ((OR: 1.86; 95%CI: 1.28 to 2.70; p = 0.001) and (OR: 2.97; 95%CI: 2.13 to 4.14; p < 0.001), respectively) (Figures 8 and 9). But no significant difference was found in intraoperative complication rate between two groups (OR: 2.02; 95%CI: 0.22 to 18.51; p = 0.53) (Figure 10). For three complication variables, pooled data of all subgroups were in accordance with those original results. 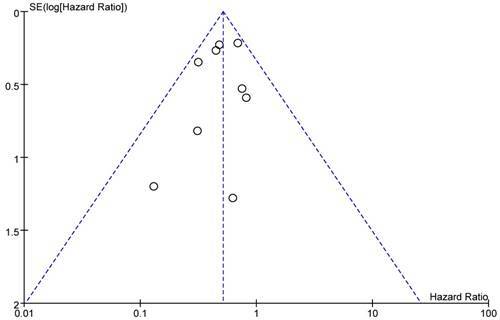 Forest plot and meta-analysis of percent eGFR decrease. 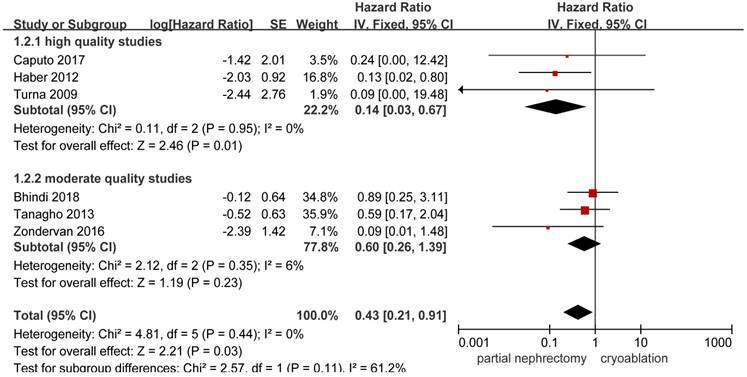 Forest plot and meta-analysis of creatinine increase. Forest plot and meta-analysis of overall complication rates. Forest plot and meta-analysis of postoperative complication rates. 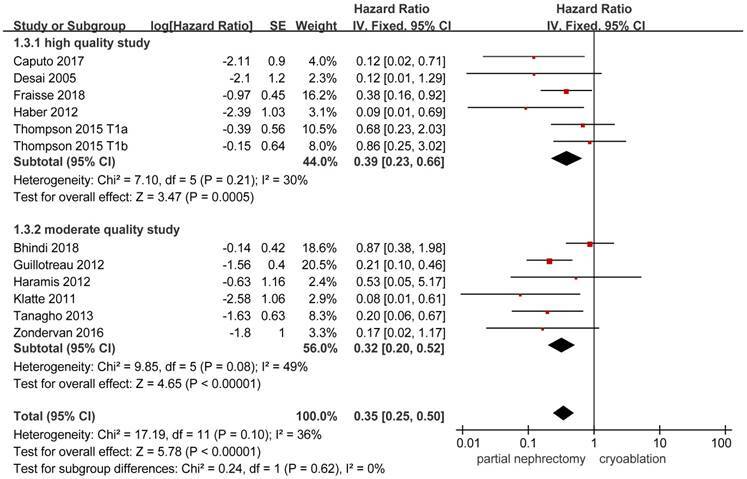 Forest plot and meta-analysis of intraoperative complication rates. ┢ hazard ratio; + Odds ratio. Sensitivity analyses were conducted by exclusion of the lowest scored study among included studies. All results except for the intraoperative complication rate were accordant with the primary outcomes. As to intraoperative complications, significant difference between the PN group and the cryoablation group was found after removing the study reported by Tanagho et al. and the heterogeneity between studies decreased to nil (OR: 5.93; 95%CI: 1.59 to 22.07; p = 0.008; I2 = 0%) (Table 2). A funnel plot of included studies reporting all-cause death was showed as Figure 11. All studies were located inside the 95%CI, which meant there was no obvious publication bias. Funnel plot of the studies that reported all-cause death. PN has been recommended as management for T1 renal tumors in guideline . For elderly patients or those with medical comorbidities, a higher surgical risk is accompanied with PN. Cryoablation has been regarded as an alternative to PN for T1 renal masses [8, 14]. However, whether cryoablation could lead to low levels of morbidities and surgical complications compared with those found in patients undergoing PN remained controversial and need to be proved further. We report the first meta-analysis of studies comparing cryoablation to PN for clinical T1 renal masses, for which the role of cryoablation is still debated [10, 13, 14]. 17 eligible studies including a total number of 4666 patients can contribute to the ongoing discuss, providing a method for further research on this topic. Cryoablation for stage T1 renal tumors is a better choice to preserve nephron with less technically demand compared with PN. But the existing advantages are counterbalanced by the worse efficacy of cryoablation to PN in achieving effective oncological outcomes. With regard to applying any new procedure, the safety is of primary significance to be taken into consideration. Both PN and cryoablation have been widely proved to be safe in the management of T1 renal masses . PN which usually requires time-sensitive suturing with hilus clamping is more technically challenging than cryoablation . According to our results a higher risk of incidences of both overall and postoperative complications was conveyed in PN group. Though no statistically significant difference about intraoperative complications between the two groups was found in original meta-analysis which was pooled with high heterogeneity, the result turned to significant in sensitivity analysis pooled without heterogeneity by eliminating the study reported by Tanagho et al. , in which many baseline characteristics were not comparable between two groups. The sensitivity analysis for intraoperative complications may hint the lower risk during the cryoablation procedure, which need to be proved further with more homogeneous studies. Better oncological control is always pursued in management of tumors. PN achieved a better prognosis compared with cryoablation with respect to all variables including all-cause death, cancer-specific death, metastasis and local-recurrence. All results were pooled with nil or low heterogeneity. Selected patients who were considered more suitable to cryoablation were usually at elder age or with significant comorbidities [10, 13, 17, 19, 20, 26]. The selection bias contributed to the significant difference about oncological outcomes between two treatments. 4 of 11 studies providing information about oncological outcomes were at risk of a significant bias on tumor size [10, 17, 19, 26], but these results may be strengthened by the poorer prognostic feature that all mean tumor diameters in the PN group among these studies were significantly bigger. When matching these three factors, pooled results about all-cause death and cancer-specific death in the high quality study subgroup kept significantly different between the two treatments ((I2: 0%; HR: 0.43; 95%CI: 0.31 to 0.61; p < 0.001) and (I2: 0%; HR: 0.14; 95%CI: 0.03 to 0.67; p = 0.01), respectively), which implies that cryoablation brings poorer rates of overall survival and cancer-specific survival. Similar results about local-recurrence and metastasis have been summarized in study comparing laparoscopic cryoablation and laparoscopic PN reported by Tang et al. . Rate of local-recurrence and metastases after renal cryoablation was deemed to be higher with more extended follow-up period . Ultrasound was used to show the advancing edge of the ice ball without providing information on whether the lethal temperature has been achieved during cryoablation through laparoscopic or percutaneous approach , which may be the reason of poorer oncological outcomes after cryoablation. To accomplish preservation of renal function was one of the main targets of nephron-sparing surgery [19, 34]. It is no doubt that PN and cryoablation are both effective in renal function protection [11, 35]. Cryoablation was associated with significantly less percent eGFR decrease and creatinine increase compared with PN. PN was usually conducted with hilum clamping, which was significantly associated with worse renal function . Renal ischemia and actual parenchymal resection represent two separate mechanisms for potential renal function decrease during PN . Cryoablation allows for direct visualization with laparoscopic approach or for real-time monitoring with percutaneous approach , which preserve functional nephron potentially [20, 33, 38]. Several limitations are worthy of discussion. The primary limitation of this systematic review and meta-analysis was that no randomized controlled trials were included, which made it hard to acquire enough data for meaningful results. Second, surgeries were performed by surgeons with different levels of surgical expertise and different choices of surgical approaches. Thirdly, patient allocation and treatment assignment were usually up to physician's attitude instead of randomized allocation, which led to a significant selection bias. Cryoablation was usually applied in elderly patient with significant comorbidities or those with a shorter life expectancy. Partial nephrectomy was chosen for renal masses with larger size. Next to last, the limited mean follow-ups in some studies resulted in follow-up bias. Finally, data about the incidences of complications was pooled with moderate or high heterogeneity using FE model. Notable strengths of this systematic review are as follows. 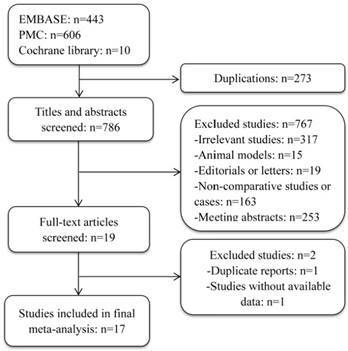 This is the first systematic review and meta-analysis comparing between cryoablation and PN for clinical T1 renal masses. The meta-analysis was conducted at an appropriate time, because more and more incidental renal tumors have been detected and enough studies have accumulated for inspection by meta-analytical methods. Studies were identified using multiple strategies, the methodological quality of the studies were evaluated according to strict inclusion and exclusion. Subgroup and sensitivity analysis were used to analyze the source of heterogeneity. Publication bias was not obvious with direct intuition. Comparing with PN, cryoablation for clinical T1 renal tumors is associated with poorer oncological outcomes, but the existing disadvantages are accompanied by lower rate of overall and postoperative complications and superior renal functional preservation. For patients with imperative indications for nephron-sparing surgery who can't risk more invasive PN, cryoablation could be an attractive option. Owing to the inherent limitations of eligible studies, conclusions drawn from our meta-analyses should be interpreted cautiously and be confirmed further with well-designed randomized controlled trials with extensive follow-up length. PN: partial nephrectomy; eGFR: estimated glomerular filtration rate; HR: Hazard ratio; MD: mean difference; OR: odds ratio; CI: confidence interval; FE: fixed-effects. Corresponding author: Bin Fu. Phone number: 8618720919501; Fax number: +86-079188698102; E-mail: urofbinncu.edu.cn.